Decellularized xeno-antigen-depleted porcine pulmonary heart valves tissues may be used as matrix implants for patients with malfunctioning heart valves. Decellularized tissues are biological scaffolds composed of extracellular matrix components. Biological scaffolds closely resemble properties of native tissue, but lack immunogenic factors of cellular components. Decellularized heart valve scaffolds need to be stored to be readily available whenever needed. Scaffolds can be stored at reduced supra-zero temperatures, cryopreserved or freeze-dried. The advantage of freeze-drying is that it allows long-term storage at room temperature. 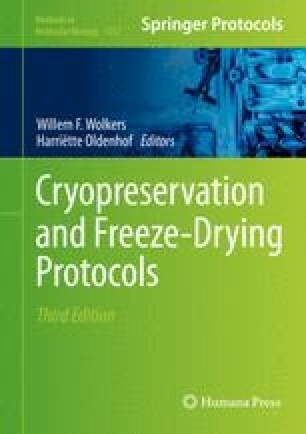 This chapter outlines the entire process from decellularization to freeze-drying to obtain dry decellularized porcine heart valve scaffolds. This work is supported by funding from the CORTISS Foundation and the German Research Foundation (DFG, Deutsche Forschungsgemeinschaft) for the Cluster of Excellence “From Regenerative Biology to Reconstructive Therapy” (REBIRTH).